or the API, we’ve added new functionality just for you. Now when you click a download button from a Webmaster Tools feature like Search queries, you'll be presented with the "Select Download Format" option where you can choose to download the data as "CSV" or "Google Docs." Choosing "CSV" initiates a download of the data in CSV format which has long been available in Webmaster Tools and can be imported into other spreadsheet tools like Excel. If you select the new “Google Docs” option then your data will be saved into a Google Spreadsheet and the newly created spreadsheet will be opened in a new browser tab. We hope the ability to easily download your data to a Google Spreadsheet helps you to get crunching on your site's Webmaster Tools data even faster than you could before. Using only a web browser you can instantly dive right into slicing and dicing your data to create customized charts for detecting significant changes and tracking longer term trends impacting your site. If you've got questions or feedback please share it in the Webmaster Help Forum. 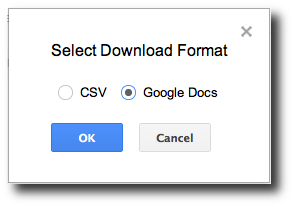 Webmaster Tools now has a new download option for exporting your data directly to a Google Spreadsheet. The download option is available for most of our data heavy features, such as Crawl errors, Search queries, and Links to your site. If you enjoy digging into the data from Webmaster Tools but don’t want to use Python scripts or the API, we’ve added new functionality just for you. Now when you click a download button from a Webmaster Tools feature like Search queries, you'll be presented with the "Select Download Format" option where you can choose to download the data as "CSV" or "Google Docs."